This ash forms part of a rocking horse base: with my modified mitre gauge excellent, accurate results were achieved quickly. It is 148mm wide! Ergonomically designed, is a phrase very much misused to describe products by some manufacturers, but Axminster do not even mention ergonomics with their latest offering to the market, the variable speed 305mm SS-12VS. As a qualified ergonomist, I was intrigued by a number of features and overall, I was certainly not disappointed. With a price tag that makes this sander stand out from the crowd, it is roughly twice the cost of many other 305mm offerings. It does need to have a few unique selling points to justify the money, and this it does. It also offers the option of a nicely made metal stand. The machine looks impressive and of high quality. It has a substantial steel chassis with two laser- or water-jet cut heavy steel quadrants holding the drive motor/disc. A rack and pinion mechanism drives the quadrant angular change via a large star wheel. A single Bristol lever clamps the two quadrants. Two further Bristol levers lock the two table support legs in position. 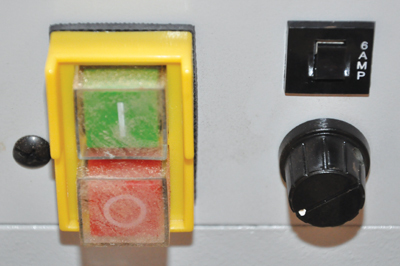 All the knobs and levers are plastic and are of a good quality, although the one clamping the quadrants does look slightly undersized for its task. The motor is 750W 180V DC with electronic speed control. In my tests at the lowest speed, applying a 100 x 40mm piece of sapele (Entandrophragma cylindricum) end grain to an 80 grit disc, I was able to apply sufficient pressure to cause the timber to 'burn' quickly with little variation in speed. There are four elements that help justify this significant investment. The most obvious is the design, allowing the motor and disc to tilt, rather than the table. Human beings tend to operate in a vertical and horizontal world: you simply prefer things in those orientations and most people are very good at detecting lines not conforming to this, such as the skewed picture on the wall. So having the table remain flat is more natural than resting a workpiece on an inclined surface and this is definitely a positive help, especially when set to do compound angle sanding. It really helps when sanding long pieces, as a support stand can be used. The second element is the variable speed. From all the disc sanders I have looked at, you often have to move up to maybe a 500mm or above industrial version to find this. Being able to reduce the abrasive surface speed for different timbers, other materials, and differing abrasive grades, will be a revelation. 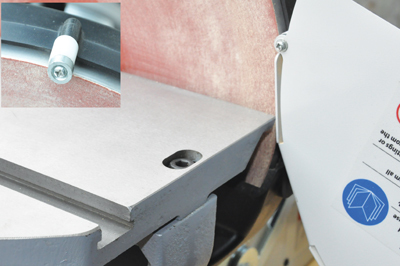 The third feature, which cannot be rated too highly, is the hook-and-loop fastening of the abrasive discs to the plate. Knowing a disc can be removed and replaced numerous times without destroying it, without cleaning adhesive residues, and with easily corrected placement, increases the versatility significantly, especially when combined with feature four. Feature four, the ease of disc access for changing, is achieved by releasing the two levers securing the table legs and letting the table move forwards. Next, adjust the disc angle to at least 30°, which allows loosening of a thumb screw either side holding the extract hood in place and hinge forwards. The only obstacle now is the sheet guard on the top, held by two Pozidriv-headed self-tapping screws. Only one need be removed as the guard then swivels out of the way giving totally unobstructed access to the disc. At this point you discover the nylon spacer behind the disc was held by the screw, just as it bounces across the workshop floor - this is my first minor niggle. If I bought this sander I would glue the spacer in place and also modify the fixing so it did not need a tool. I suspect many people will simply remove it and leave it off, however. Checking for accuracy is easy. First check that the disc is upright - 90° to the table. For setting angles the quadrant has pre-set detents at -5, 0, 15, 22.5, 30 and 45°, although you can set any between those limits. It is slightly awkward as the detent button must be pressed while rotating the star wheel and also held while tightening the Bristol lever. Initially, I found this difficult but a couple of minutes playing and it became pretty easy. 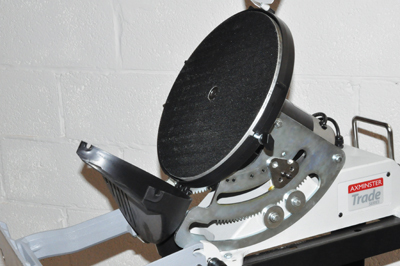 The second niggle: play in the detent button/peg means exerting any torque on the star wheel whilst securing could cause a variation in the set position. It was of the order of 1-2° on the machine I had. If you want maximum accuracy, you would carefully check after each adjustment anyway, but I think this should be better than it is. After setting the disc upright you can check the table/disc is 90° and if not, adjust the stops at the bottom of the two legs. The third niggle: you release a lock nut on each of the grub screw stops, then find there is no slot in the end of the grub screw to adjust or hold as you retighten the lock nut. You can adjust the table distance from the disc and also correct it for parallel - of the mitre slot - using two Allen screws accessed from the top. It is disappointing that, at this price, no tools are supplied. A substantial mitre fence is supplied with a steel sliding guide bar with retaining washer, and cast aluminium fence with machined underside and face. The face was slightly concave but of no consequence. Unfortunately the face was not perpendicular to the table surface by a degree or more - enough to prevent the accuracy you could potentially achieve. It needs a wooden sub-fence adding in any case, so this is easily corrected. So how did it perform? Well, I did end grain on some large - 100 x 40mm - and smaller - 40 x 30mm - sapele (Entandrophragma cylindricum) stock, some angles on iroko (Milicia excels) - 75 x 35mm - and also multiple mitres on some softwood. The results were all impressive. I did some of the mitres the hard way, setting the disc at 45° and the timber straight across the table guided by the mitre fence. This way you have less variation in abrasive speed across the width of the workpiece but everything needs to be accurately set up for this to give good results. I was able to do this. Subsequently, using a modified mitre gauge, I refinished pieces of ash (Fraxinus excelsior) from a Rocking Horse Shop kit I am making. This was just over 145mm wide, the end was square and the bevel was 45° - with impressive accuracy. One piece was around 1,200mm long but with the horizontal table, the 45° end bevels were easy. Being able to slow the speed and using light pressure, allowed a very acceptable finish to be achieved, even with the 80 grit. 180 grit tested later produces the fine finish you would expect. I was concerned that using hook-and-loop discs might cause 'give' in the surface and affect the flatness, but there was little evidence of this. 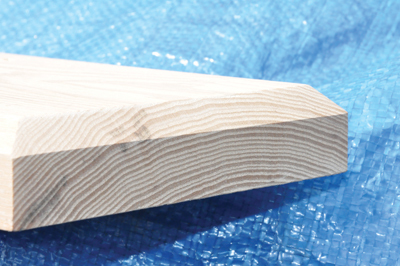 Applying more pressure did suggest a slight cutting back of edges, forming a very slight rounding of end grain, so finesse is appropriate for final accurate finishing. Using a finer grit grade would also reduce any 'rounding'. The extraction worked really well, and it isn't excessively noisy, but you may find a problem with hose sizes if using a vacuum extractor. The instructions are good and easy to follow, but unfortunately, these are only available online. 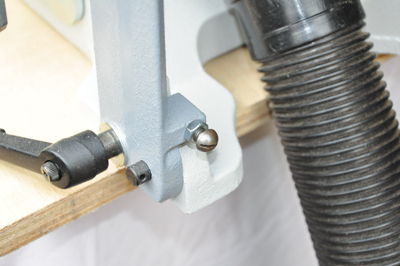 With some simple, and some not so, changes it is possible to raise the performance of this superb sander even higher. The first job has to be making disc changing even easier. To do this, I removed the top securing screw from the quadrant guard, then replaced it with a 10mm countersunk rare earth magnet, leaving the guard unsecured at the top. To keep the guard parallel, I then placed another magnet between the guard and its right-hand mounting on the plastic shroud, but any spacer could be used here. The guard then pivots about this right-hand screw but the magnet at the top keeps it nicely in place in use. The second easy job is changing the adjusting screws for the table uprights. Easy, that is, if you have ready access to ?in BSW - British Standard Whitworth - set screws as I have. After these two simple procedures, I suggest using a fine-cut file to take sharp edges off the mitre slot, and an old craft knife blade as a scraper to relieve the arris of the holes on top of the table. To modify the mitre gauge, I first wanted to use it in the direction shown but utilising the guide bar washer that locates in the mitre slot. I had to reverse the bar, which means drilling and tapping a ?in BSW thread in the bar on the opposite end. If you are not used to doing this, ensure you use a drill press to have an accurate clearance hole, first using the punch to mark the exact location. 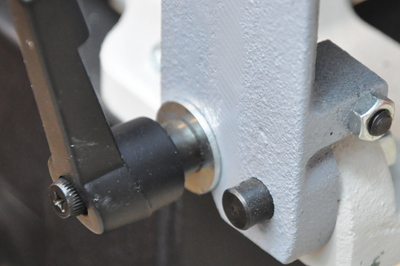 You can also use the taper tap in the drill press, turning it by hand until it is nicely engaged and cutting sufficient thread to keep it square. The basic use of a tap means forwards half a turn, then reverse a quarter of a turn to break the metal chips. If you don't do this, and don't use use oil lubricant or a thread cutting compound, they are easy to break, but getting a broken one out isn't! With this bar thickness, just a taper tap is enough to ensure a full through parallel thread. 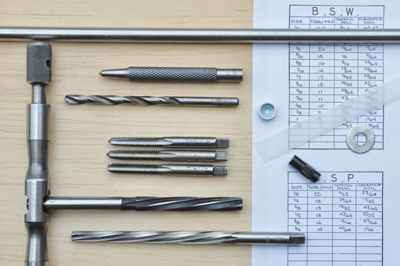 The others shown in the photo make up a full set capable of threading into blind holes. I then found that a 6mm washer on the handle thread, between the underside of the mitre casting and the top of the bar, stopped the bar lifting and tilting the gauge when the handle was tightened. The next issue was the pivot pin being a bit sloppy. As I had 5/16in bar available, plus suitable reamers, I decided to make an accurate pivot point. First a taper reamer was run carefully through the mitre hole, followed by a parallel reamer. The result was an accurate hole that the stainless bar fitted in with a nice smooth push. I then did the same with the hole in the casting. To hold the bar in the casting, I made a few centre punch marks on the new pivot where it would be in contact with the casting hole. Light hammer application adjusted the projection length through the mitre bar and hey presto! No slop whatsoever. There was a very small amount of 'slop' between the bar and mitre slot in the table but there is no easy way to deal with this. Finally I made a wooden fence, the length just up to the face of the quadrant guard, which then allows clearance to turn the gauge through angles without the fence fouling the disc. I used a single piece of plastic shim from a milk bottle to tweak the fence to 90° to the table. It all works so much better than the supplied gauge, which is not too bad in itself. 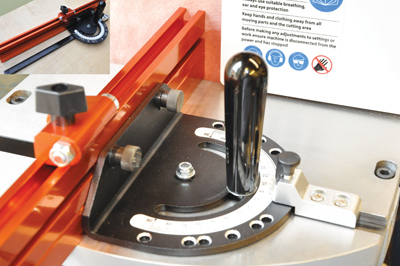 If you want to go upmarket with the fence for your disc sander, then look no further than the UJK Precision Mitre Gauge and Fence, also available from Axminster Tool Centre. At Â£65.95, this is a real bargain compared with many others available, yet with minor tuning, it performs admirably. 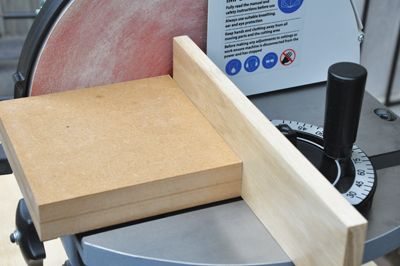 Out of the box you should always check the zero setting and remember that with the disc sander, this will rely very much on you having adjusted the table slot to be parallel to the disc. The photo shows the complete package; it is unlikely you would use the flip-stop but it is there if you decide to share the gauge with other machines. Two Allen keys are also included for making adjustments. There are a couple of disadvantages when used with this sander: the 'T' bar is too long but in practice, I didn't find that a difficulty. The second is that the fence is a little long. Axminster is considering making the fence extrusion available as a separate item and I would be tempted to use one cut to size, but it works as it is. The photo shows a distinct advantage compared with many others; it closes to 0°, which is very useful for storage purposes. However, I would suggest a little tuning; a minor problem is the ball-ended grub screws in the 'T' bar, which adjust to eliminate a sloppy fit in the slot. These work well but are too loose and will not hold a setting for long. They are easy to improve with thread-lock fluid. 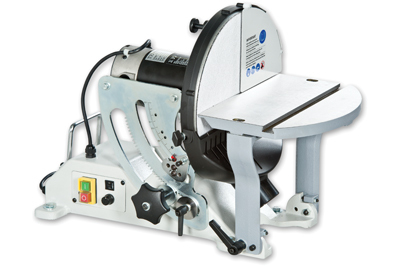 For many people, the more standard offering disc sander from Axminster, at just over half the cost of the SS-12VS, will do everything you want. Personally I think easily replaceable abrasive discs, combined with really easy access for that task is the way to go as being able to change abrasive grade in about 90 seconds - if you do not drop the spacer - means you will do it. I have two normal sanders and I just do not change discs, as it is too much hassle and cost. If you want accuracy and the ability to change grit grade as often as you want, this is the one for you. And yes, I would describe this as being ergonomically designed to make it easier to use, safer and more accurate. I liked it so much that I bought one!